My visits to the market were irregular up until a year ago. Then i discovered the Meiden, or as you say in English, the Girls. 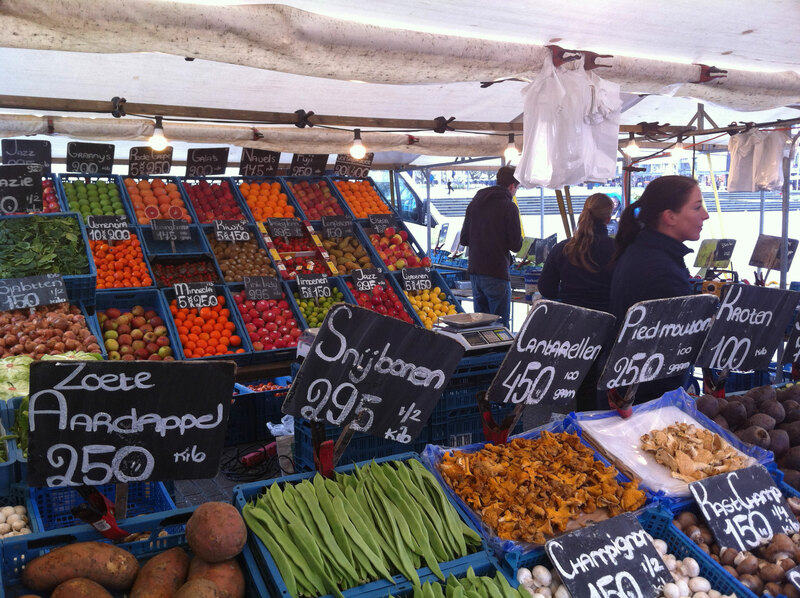 They have a big vegetables and fruits market stall. I buy my veggies and fruits at them at least once a week. When i have the time i go there on Tuesday as well. 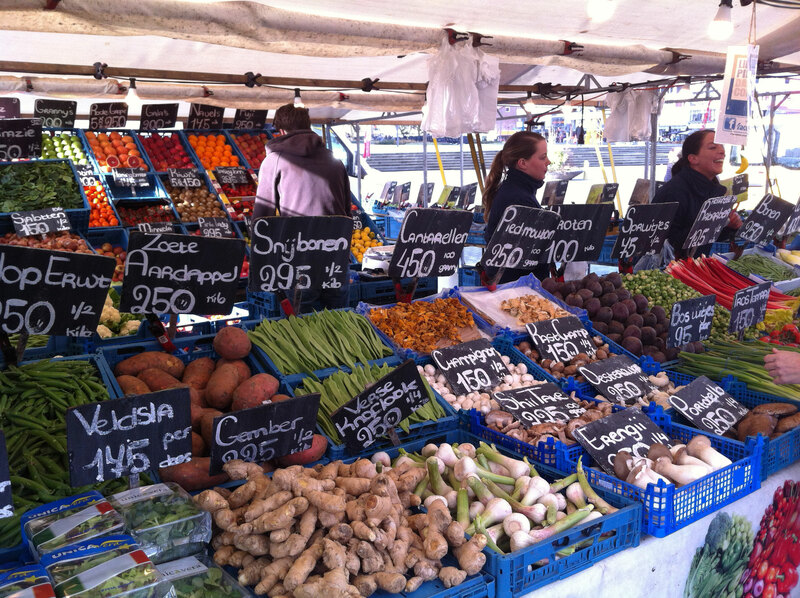 They have an excellent mixture: Roseval potatoes, tomatoes, carrots, cauliflower, leek, rocket salad, fresh garlic, onions, apples, pears, bananas, raspberries, grapefruit, rhubarb, mango, beans, spinach, sauerkraut, parsnip, cantarelles, portobello’s, tarragon, parsley, coriander. The list goes on and on. Basically anything you want. I asked them if they wanted to be in my blog as a first post on where i do my shopping in Rotterdam. They said yes! This morning, Tuesday morning 24 February, we had a short talk about their stall and the market. 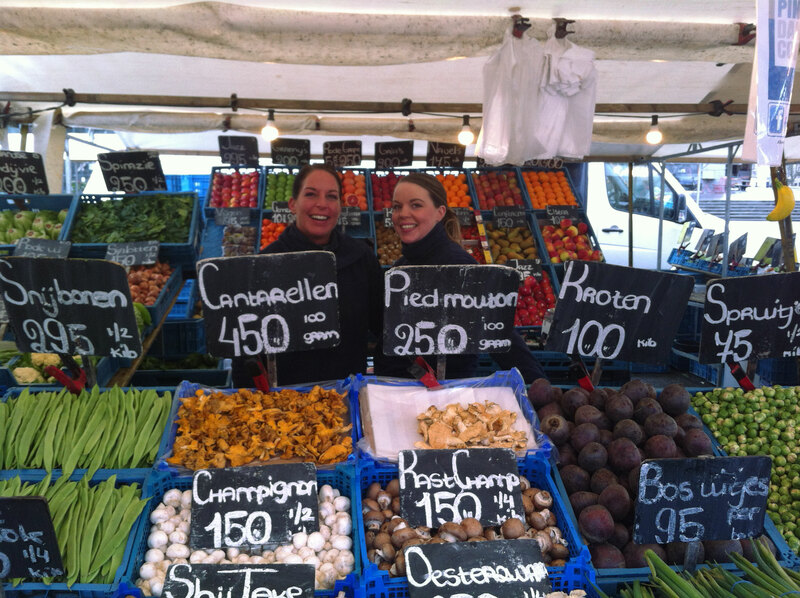 Their mother, Nella, started working on the market when she was 19, in the stall of her father-in-law. He was of the old school, have the good stuff up front, sell the bad stuff at the back first. When Nella started for herself, she decided it was gonna be different for her. It’s all good stuff. 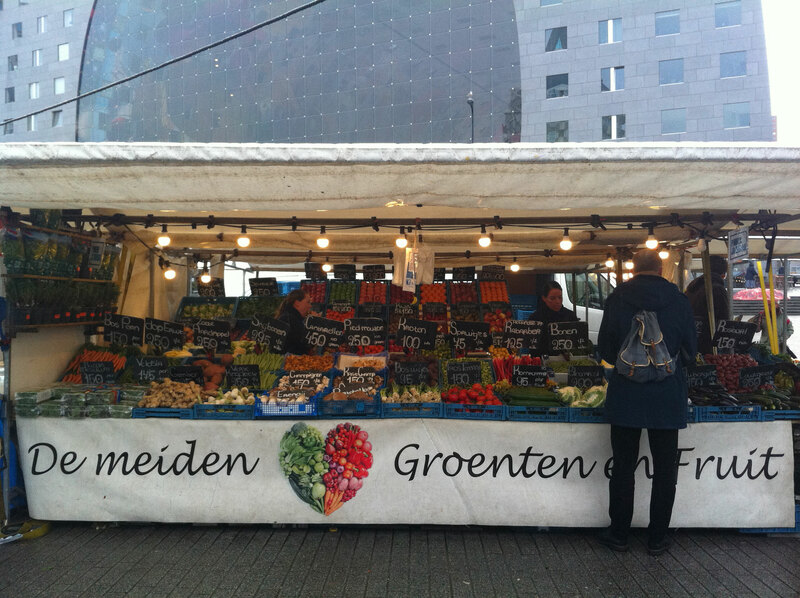 I usually go straight to the market stall of the Meiden. Sometimes i get me a turkish pizza. Or a roll with raw herring. Or chips! Hmmm. But i do see the other stalls around. There are a couple of other good ones, but not with as many options as the Meiden have. The only other i go to is one for some floury potatoes. 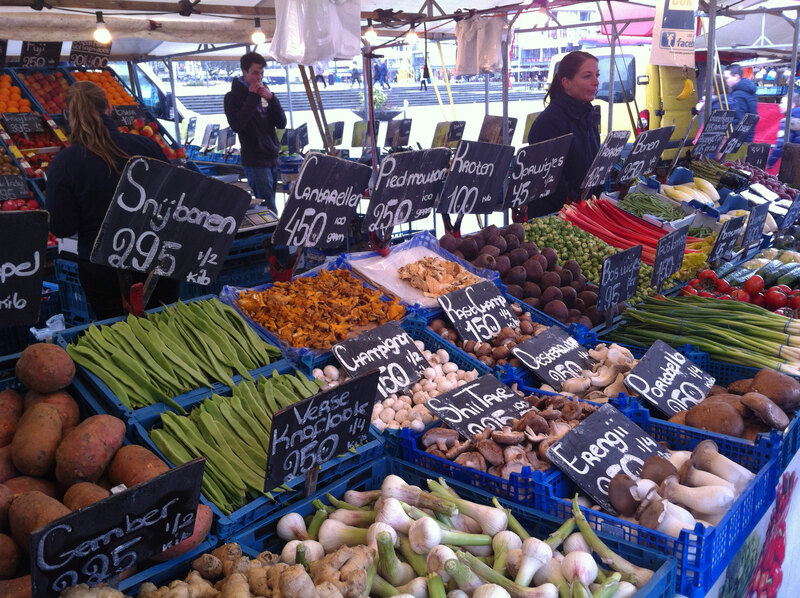 I do see a lot of stalls with a supermarket structure, where you pick your own veggies and pay at a counter. That is OK, i bought stuff there too. Or stalls where everything they sell is packaged in plastic. Where i think ‘ooh, that must have been really cheap to buy’. I’m happy i found the Meiden, happy with what they sell, happy with the price too. Yes, i know they are more expensive as other stalls on the market, but it’s still cheaper than a supermarket most of the time. I also like it that they help me. I give my shopping bag to them, they package all the veggies and fruits for me. And you actually do get a receipt! Daisy and Elice, and Nella too! thank you for allowing me to write this post. Please, keep on doing what you do! 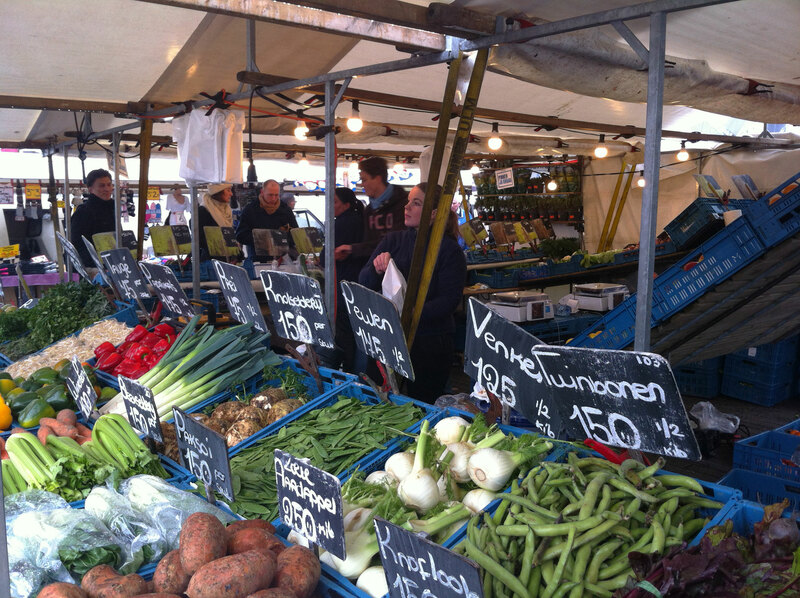 On Tuesday and Saturday the Meiden stand on the Central Market on the Binnenrotte. 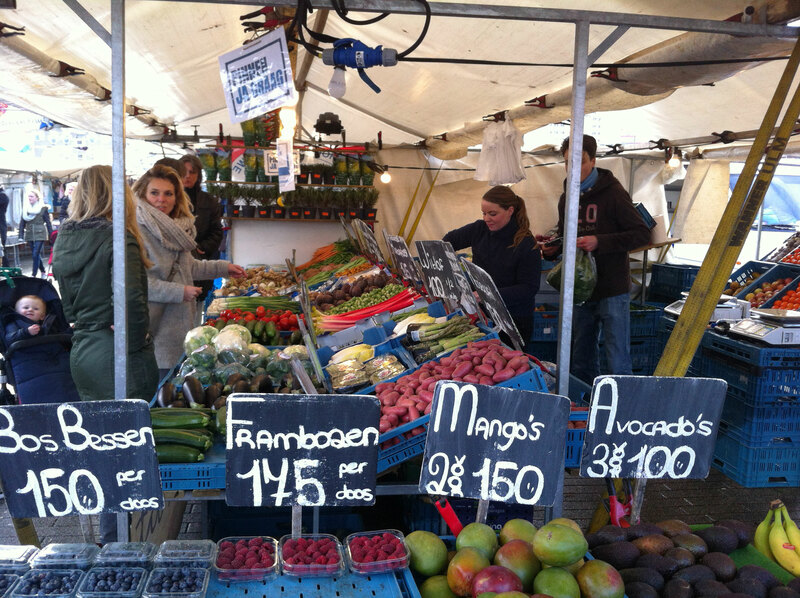 On Wednesday they stand on the Ommoord market on Hesseplaats. Article on De buik van Rotterdam. You can read the comment i made there in November 2014, yeah.. in Dutch. The rhubarb to the right. The first time this year i see them. They are from the greenhouse and look fabulous. De Meiden op de markt op de Hesseplaats te Rotterdam. De 1e en de laatste keer. De meiden zelf o.k , maar er loopt een wat oudere dame,nee geen dame, maar hulp. Wij 78 en 71 jaar met twee volle tassen vragen op een plastic tasje en de hulp zegt dat er nog wel plaats is in onze overvolle 2 tassen. Dat is er niet dus ik vraag een plastic tasje dat iedereen van de meiden krijgt, maar dat wordt een probleem. Uiteindelijk toch een tasje met duidelijke boodschap dat dat me 10 cent gaat kosten. Wat fijn , nou ik had nog wel 10 cent en dus met zwaar bevochten tasje naar huis en nooit meer naar de meiden als we deze oude chagrijn zien staan.